I'm still riding the Christmas train! I just finished putting together this video of all my festive gatherings. The song is It's Christmastime by Mr. Speaker, a local band who write songs for charity. I saw them performing this December, and last December, when they were at the Letchworth Arts Centre and I was working on the bar both times. They are guaranteed to put you in the Christmas mood. I'm not saying now, but bare that in mind for next year! They even have a whole album of original Christmas songs. These are my kind of people. All their music is available to buy from here and you make a donation to their chosen charities in the process. And, I guess I should wish you a happy and healthy new year. Or whatever. Who likes my Cookie Monster pyjamas? Many Christmas movies were watched, Christmas songs were sung and a lot of food was eaten. And is still being eaten. Does anyone want a mince pie? We've got quite a lot. 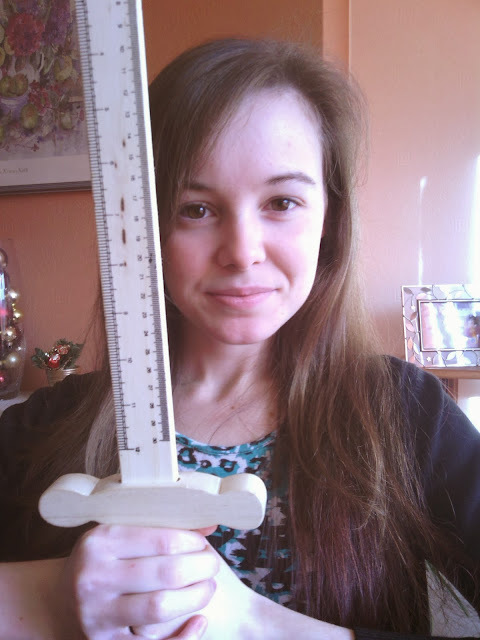 My sister gave me a sword ruler! I think we can all tell from this photo who the favourite daughter is. Christmas Day, Boxing Day and the 28th were spent with family which was lovely. On the 28th there were so many of us we had to gather in a church hall as we wouldn't all fit in my cousin's house. What festive things did you get up to this week? At one of the Christmas craft fairs I had a stall at, my Mum bought these wood cut decorations. The stall was being manned by a boy selling the things his Grandfather made, including wonderfully finished boxes and nativity scenes. And lots of these decorations - 4 for a £1. I decorated them by painting the picture part in the middle with water colour paint so the texture of the wood would still show through. Then I painted the rest with gold acrylic paint and finished them with a coat of gold glittery nail varnish over the gold parts. Because glitter = Christmas. Then I strung them up with invisible thread and added them to the tree. 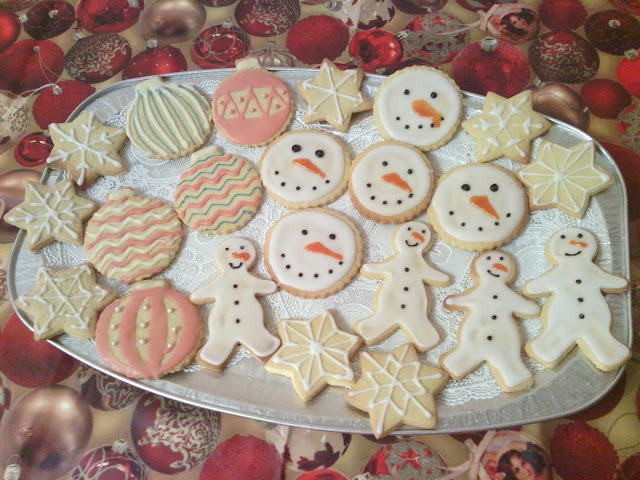 ...had the Annual Gift Exchange with my friends, for which I made all these Christmas cookies! They were a hit, even with some of the snowmen's dodgy noses. On Saturday we took my Grandad and my sister, who's home for Christmas, to see my exhibition at Radlett, and then to see the open exhibition I have a piece in at the Museum of St. Albans, organised by the University of Hertfordshire. 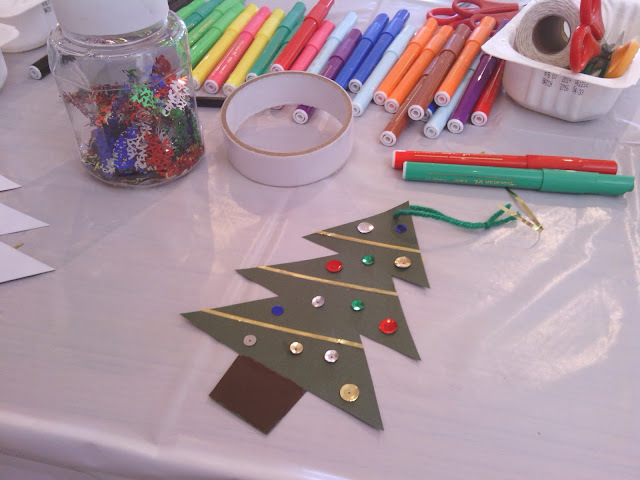 And on Sunday I helped out at the Art Centre's Christmas Crafternoon making fun little decorations. All ready for Christmas? Only 3 more sleeps! In October she went on a trek across Jordan to raise money for Macmillan Cancer Support, so I took one of her photos from the trip off Facebook to paint. This is her shocked face. 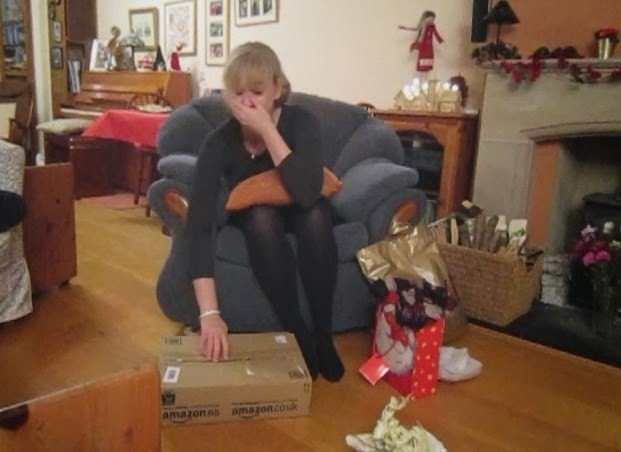 I think she liked it - I made her cry! I got her a few other things including a mug with photos of us from last year's Annual Gift Exchange, ordered from Photobox, along with tea and biscuits. She treats those teabags like gold! I was given Laguna Beach season 2 on dvd and a whole lots of Bueno! During our latest trip to the Scrap Store my Mum picked up a roll of what we thought was just star sequin waste. You know that stuff with holes in where the sequins have been punched out? When we got it home we unrolled it to find a pre-made Christmas card hanger! So we hung it up on the side of our CD shelf. It's got 3 star bursts at the top. And mini gold pegs already attached to hang cards on. We usually hang Christmas cards on the side of the stairs in the hallway, so we've reserved this hanger for cards from each other. And this is our tree! I think my Dad put every red and gold thing we have on it. I love it! This week I was quite busy with boring stuff, but I had a fun day on Saturday. My Mum and I started with a trip to the Scrap Store. They had loads of tinsel up for grabs, and grab I did! 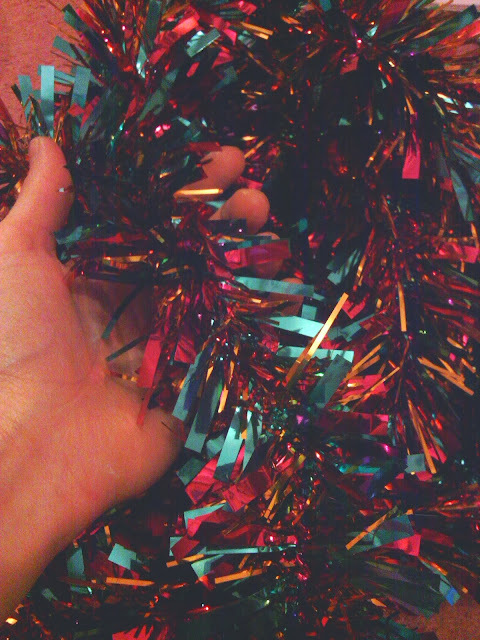 I got this cool blue, pink and gold tinsel. I don't where I'm going to put it yet because our tree is strictly red and gold. Then we moved on to some shops to pick up a few Christmas presents. 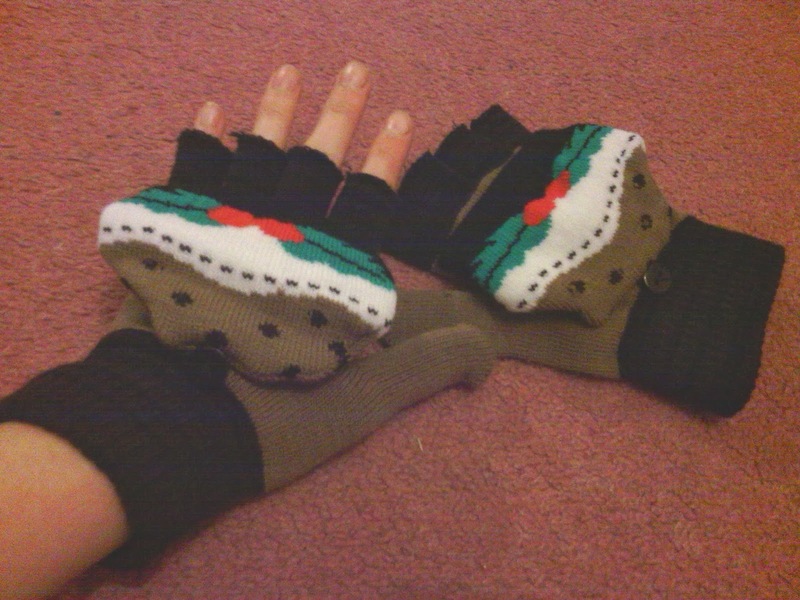 I bought myself these gloves. They look like Christmas puddings you guys! 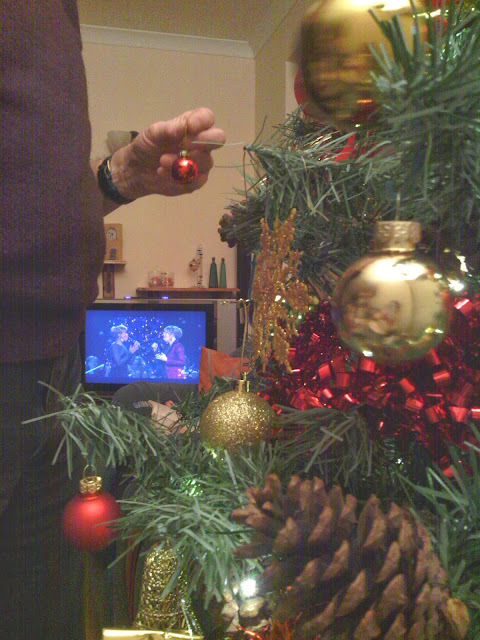 In the evening my Dad and I put up the Christmas tree whilst watching CMA's Country Christmas. 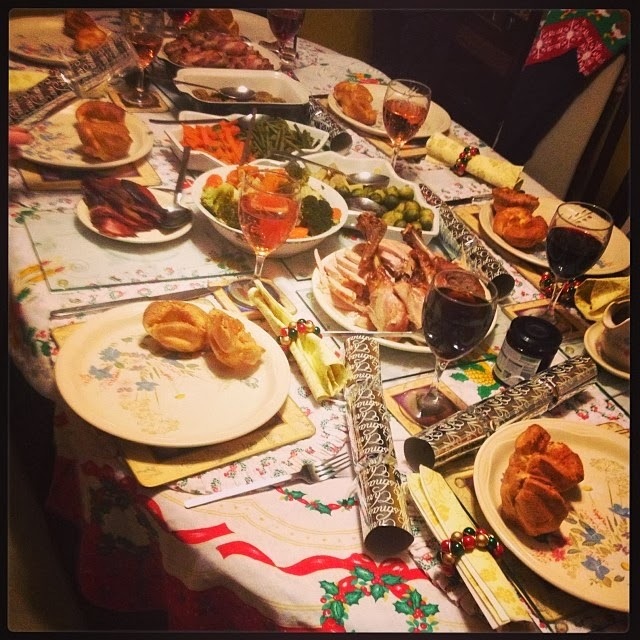 As I said on Sunday last week my friends and I had our Bring and Share Christmas Dinner. For a look at past dinners click here. We always split up the meal so each person brings something and this year I was given desserts. I made an apple crumble, Christmas cookies and a chocolate cake. This was the recipe I used for the apple crumble. Just some notes I jotted down from my Mum's instructions. I'd never made one before but I think my first attempt when pretty well. It was just your standard apple crumble, but I added some dried cranberries in with the apple for a festive touch. ...and some into snowflakes complete with a sprinkling of edible glitter. Because it's Christmas! There were also some angels, stars and Christmas trees. The cookies were a big hit with my friends wrapping up the left over ones to take home. And finally the chocolate cake. I used this recipe and it is a winner. I finished it off with some dark chocolate curls from Jordans Mill. Jordans as in the cereal company, so these chocolate curls are the same ones you get in the chocolate Country Crisp. We had way to much food so some of these came back home with me - but my family weren't complaining! 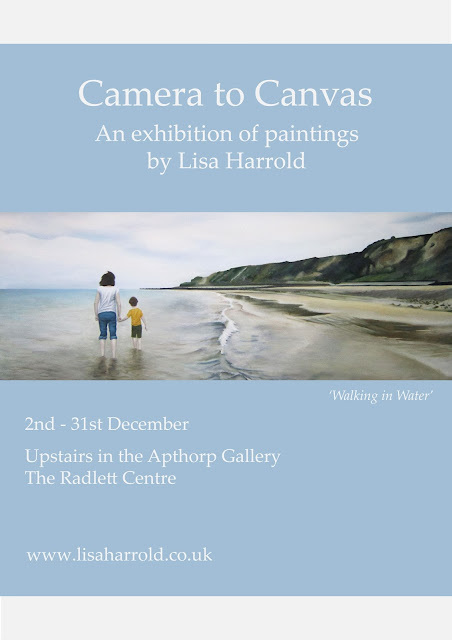 ...put up my exhibition at the Radlett Centre with my Dad's help. The exhibition features over 20 of my paintings and it's really great to see them all hung together. It's up for almost a month which should be plenty of time for lots of people to have a look, and maybe even make a purchase. Also this week I finished a few extra things for my stall at the Letchworth Arts Centre's Christmas Craft Fair. What do we think of the elf on the stocking? I like the pom-pom on his hat. Thanks for the photo Lizzi! On Thursday my friends and I had our 7th Annual Bring and Share Christmas Dinner. This year we had additions like asparagus and a cheese board. We're getting fancy! I'll share my contributions to the dinner next week. What Christmassy things have you been up to? Here are some more Christmas decorations I've been working on. These are a fun alternative to the winter scenes I usually paint on baubles. First I painted the whole thing brown. Once that had tried I painted the white for the icing. Then I covered the icing in glitter. I used clear glitter that on mass looks white. I painted the top part red for the holly berry and stuck on some holly leaves made out of painted green card. Really simple but really fun. These ones I made have already sold at the Letchworth Arts Centre's Christmas Craft Fair. I may have to make some more! 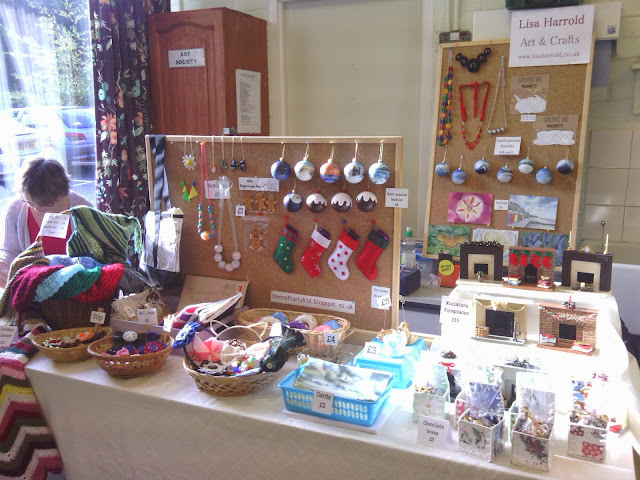 I'm now done with all the craft fairs I'm doing this season - well the Letchworth Arts Centre one is on going but I'm done with the setting up - so I thought I would talk about how I arrange my stalls. This is how my table looked this year. 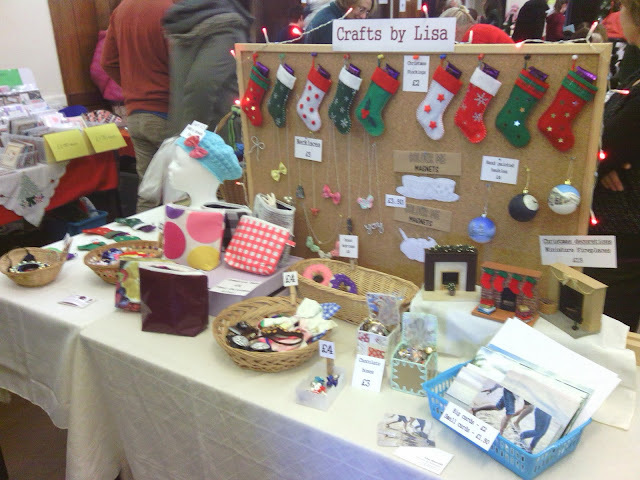 At this particular craft fair I was fortunate to have the space to have two notice boards as part of my display, but usually it's just one. The cork boards I use were purchased at a local car boot for £1 each! One was still in the packaging. Such a bargain, especially since I couldn't find one the size I wanted in the shops, let alone for such a cheap price. My Dad made this stand for the board which is two planks of wood held together by three long screws which can be tightened around the board to make it stand up. My displays this year have been all about baskets. In fact a lot of displays I saw this year used them. Mine came from around my house and from charity shops. That round one in the middle was only 50p. I always make sure everything is clearly labelled with its price because as a customer I hate having to ask how much something is. This year I started using clothes pegs to display the price of everything within a basket. It helps to group together things that have the same price. 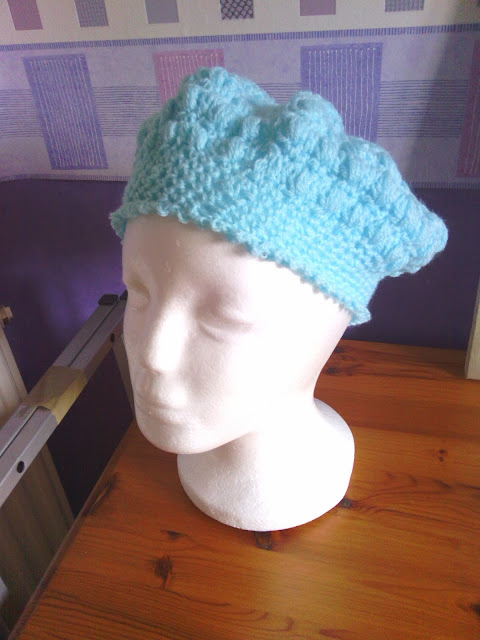 To display the crochet hats my Mum made I bought this polystyrene head on Ebay. I call her Creepy Maureen. As well as the cork board stand I also have this rail stand, also made by my Dad. I use this one to display my hand painted baubles and other hanging ornaments. This is how my displays have looked in the past. Before the cork boards I used a piece of trellis in the wooden stand. I also used bright blue cloths on the table to be eye-catching, but I prefer the simpler white tablecloths I use now. Another thing I do at craft fairs is have a list of all the items with the prices and every time I sell something I mark it off. 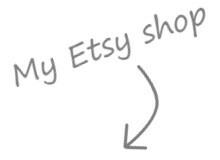 This helps me keep track of what's popular and how much I sell at different fairs. Have any of you done craft fairs? Have any display tips? 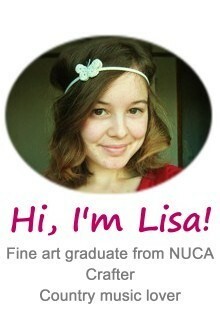 ...have been preparing for my exhibition which goes up next week. 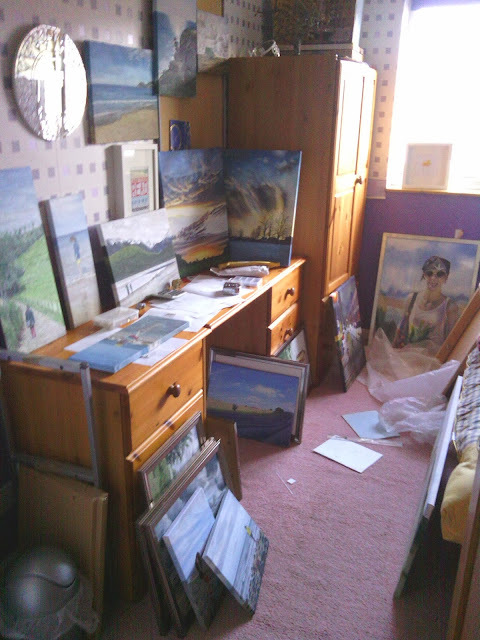 When I'm earning the big bucks I'm going to employ someone to do all this and I'll just do the paintings. On Saturday I had a table at my local Christmas Fayre. I did quite well considering it was a community event with things like tombolas and raffles, as opposed to a craft fair. The person who had the table next me didn't turn up so I was allowed to spread on to that table which was great. My best seller was definitely the Christmas stockings. I've made so many! Now that it's December are you getting into the Christmas spirit? Does anyone have their trees up yet?